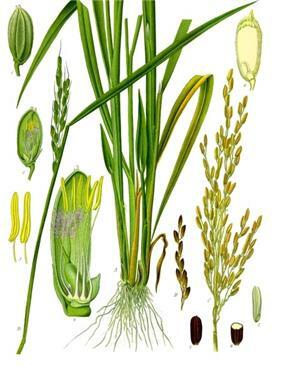 Rice is the seed of the monocot plants Oryza sativa (Asian rice) or Oryza glaberrima (African rice). As a cereal grain, it is the most widely consumed staple food for a large part of the world's human population, especially in Asia. It is the agricultural commodity with the third-highest worldwide production, after sugarcane and maize, according to data of FAOSTAT 2012. Since a large portion of maize crops are grown for purposes other than human consumption, rice is the most important grain with regard to human nutrition and caloric intake, providing more than one fifth of the calories consumed worldwide by humans. Chinese legends attribute the domestication of rice to Shennong, the legendary Emperor of China and inventor of Chinese agriculture. Genetic evidence has shown that rice originates from a single domestication 8,200–13,500 years ago in the Pearl River valley region of China. Previously, archaeological evidence had suggested that rice was domesticated in the Yangtze River valley region in China. From East Asia, rice was spread to Southeast and South Asia. Rice was introduced to Europe through Western Asia, and to the Americas through European colonization. Rice can come in many shapes, colours and sizes. Photo by the IRRI. Rice is normally grown as an annual plant, although in tropical areas it can survive as a perennial and can produce a ratoon crop for up to 30 years. 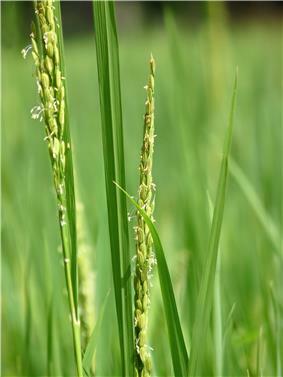 The rice plant can grow to 1–1.8 m (3.3–5.9 ft) tall, occasionally more depending on the variety and soil fertility. 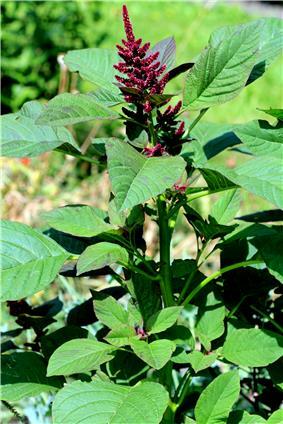 It has long, slender leaves 50–100 cm (20–39 in) long and 2–2.5 cm (0.79–0.98 in) broad. 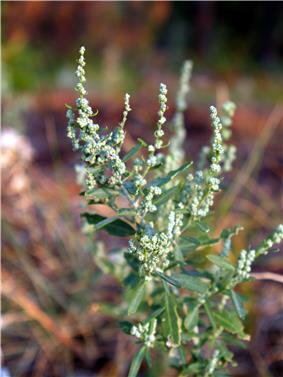 The small wind-pollinated flowers are produced in a branched arching to pendulous inflorescence 30–50 cm (12–20 in) long. 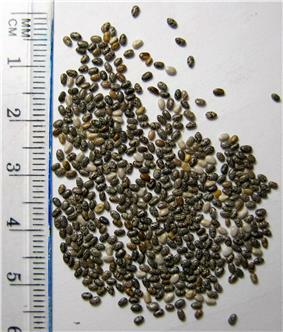 The edible seed is a grain (caryopsis) 5–12 mm (0.20–0.47 in) long and 2–3 mm (0.079–0.118 in) thick. First used in English in the middle of the 13th century, the word "rice" derives from the Old French ris, which comes from Italian riso, in turn from the Latin oriza, which derives from the Greek ὄρυζα (oruza). The Greek word is the source of all European words (cf. Welsh reis, German Reis, Lithuanian ryžiai, Serbo-Croatian riža, Polish ryż, Dutch rijst, Hungarian rizs, Romanian orez). The origin of the Greek word is unclear. It is sometimes held to be from the Tamil word அரிசி (arisi), or rather Old Tamil arici. However, Krishnamurti disagrees with the notion that Old Tamil arici is the source of the Greek term, and proposes that it was borrowed from descendants of Proto-Dravidian *wariñci instead. Mayrhofer suggests that the immediate source of the Greek word is to be sought in Old Iranian words of the types *vrīz- or *vrinj-, but these are ultimately traced back to Indo-Aryan (as in Sanskrit vrīhí-) and subsequently to Dravidian by Witzel and others. The varieties of rice are typically classified as long-, medium-, and short-grained. The grains of long-grain rice (high in amylose) tend to remain intact after cooking; medium-grain rice (high in amylopectin) becomes more sticky. Medium-grain rice is used for sweet dishes, for risotto in Italy, and many rice dishes, such as arròs negre, in Spain. Some varieties of long-grain rice that are high in amylopectin, known as Thai Sticky rice, are usually steamed. A stickier medium-grain rice is used for sushi; the stickiness allows rice to hold its shape when molded. Short-grain rice is often used for rice pudding. Rice is typically rinsed before cooking to remove excess starch. Rice produced in the US is usually fortified with vitamins and minerals, and rinsing will result in a loss of nutrients. Rice may be rinsed repeatedly until the rinse water is clear to improve the texture and taste rice. Rice is cooked by boiling or steaming, and absorbs water during cooking. With the absorption method, rice may be cooked in a volume of water similar to the volume of rice. With the rapid-boil method, rice may be cooked in a large quantity of water which is drained before serving. Rapid-boil preparation is not desirable with enriched rice, as much of the enrichment additives are lost when the water is discarded. Electric rice cookers, popular in Asia and Latin America, simplify the process of cooking rice. Rice (or any other grain) is sometimes quickly fried in oil or fat before boiling (for example saffron rice or risotto); this makes the cooked rice less sticky, and is a cooking style commonly called pilaf in Iran and Afghanistan or biryani (Dam-pukhtak) in India and Pakistan. In Arab cuisine, rice is an ingredient of many soups and dishes with fish, poultry, and other types of meat. It is also used to stuff vegetables or is wrapped in grape leaves (dolma). When combined with milk, sugar, and honey, it is used to make desserts. In some regions, such as Tabaristan, bread is made using rice flour. 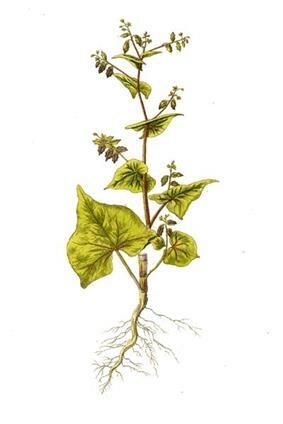 Medieval Islamic texts spoke of medical uses for the plant. Rice may also be made into congee (also called rice porridge, fawrclaab, okayu, Xifan, jook, or rice gruel) by adding more water than usual, so that the cooked rice is saturated with water, usually to the point that it disintegrates. Rice porridge is commonly eaten as a breakfast food, and is also a traditional food for the sick. An illustrative comparison between white and brown rice of protein quality, mineral and vitamin quality, carbohydrate and fat quality suggests that neither is a complete nutrition source. Between the two, there is a significant difference in fiber content and minor differences in other nutrients. Brilliantly colored rice strains, such as purple rice, derive their color from anthocyanins and tocols. Scientific studies suggest that these color pigments have antioxidant properties that may be useful to human health. In purple rice bran, hydrophilic antioxidants are in greater quantity and have higher free radical scavenging activity than lipophilic antioxidants. 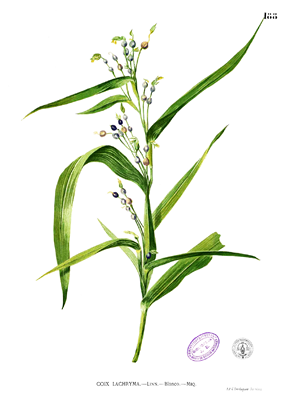 Anthocyanins and γ-tocols in purple rice are largely located in the inner portion of purple rice bran. Comparative nutrition studies on red, black and white varieties of rice suggest that pigments in red and black rice varieties may offer nutritional benefits. Red or black rice consumption was found to reduce or retard the progression of atherosclerotic plaque development, induced by dietary cholesterol, in mammals. White rice consumption offered no similar benefits, and the study claims this to be due to absent antioxidants in red and black varieties of rice. The table below shows the nutrient content of major staple foods in a raw form. 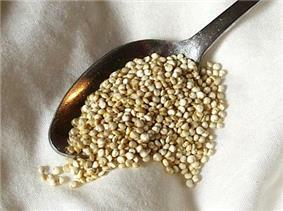 Raw grains, however, are not edible and can not be digested. These must be sprouted, or prepared and cooked for human consumption. In sprouted and cooked form, the relative nutritional and anti-nutritional contents of each of these grains is remarkably different from that of raw form of these grains reported in this table. Rice and rice products contain arsenic, a known poison and Group 1 carcinogen. There is no safe level of arsenic, but, as of 2012, a limit of 10 parts per billion has been established in the United States for drinking water, twice the level of 5 parts per billion originally proposed by the EPA. Consumption of one serving of some varieties of rice gives more exposure to arsenic than consumption of 1 liter of water that contains 5 parts per billion arsenic; however, the amount of arsenic in rice varies widely with the greatest concentration in brown rice and rice grown on land formerly used to grow cotton; in the United States, Arkansas, Louisiana, Missouri, and Texas. The U.S. Food and Drug Administration (FDA) is studying this issue, but has not established a limit. China has set a limit of 150 ppb for arsenic in rice. White rice grown in Arkansas, Louisiana, Missouri, and Texas, which account for 76 percent of American-produced rice had higher levels of arsenic than other regions of the world studied, possibly because of past use of arsenic-based pesticides to control cotton weevils. Jasmine rice from Thailand and Basmati rice from Pakistan and India contain the least arsenic among rice varieties in one study. There have been plenty of debates on the origins of the domesticated rice. 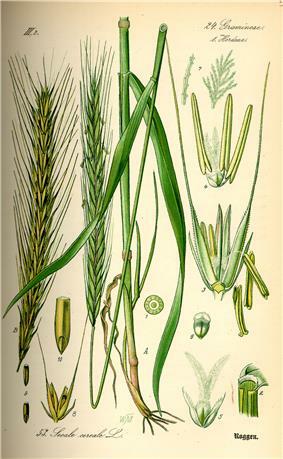 Genetic evidence published in the Proceedings of the National Academy of Sciences of the United States of America (PNAS) shows that all forms of Asian rice, both indica and japonica, spring from a single domestication that occurred 8,200–13,500 years ago in China of the wild rice Oryza rufipogon. 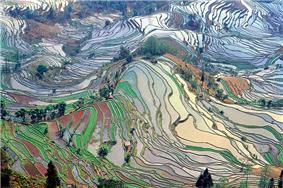 A 2012 study published in Nature, through a map of rice genome variation, indicated that the domestication of rice occurred in the Pearl River valley region of China based on the genetic evidence. From East Asia, rice was spread to South and Southeast Asia. Before this research, the commonly accepted view, based on archaeological evidence, is that rice was first domesticated in the region of the Yangtze River valley in China. Morphological studies of rice phytoliths from the Diaotonghuan archaeological site clearly show the transition from the collection of wild rice to the cultivation of domesticated rice. The large number of wild rice phytoliths at the Diaotonghuan level dating from 12,000–11,000 BP indicates that wild rice collection was part of the local means of subsistence. Changes in the morphology of Diaotonghuan phytoliths dating from 10,000–8,000 BP show that rice had by this time been domesticated. 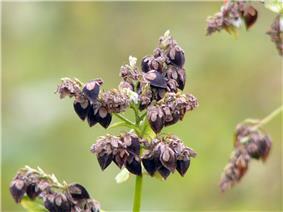 Soon afterwards the two major varieties of indica and japonica rice were being grown in Central China. In the late 3rd millennium BC, there was a rapid expansion of rice cultivation into mainland Southeast Asia and westwards across India and Nepal. In 2003, Korean archaeologists claimed to have discovered the world's oldest domesticated rice. 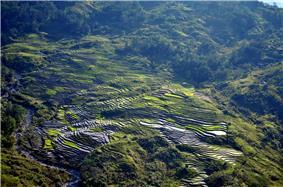 Their 15,000-year old age challenges the accepted view that rice cultivation originated in China about 12,000 years ago. These findings were received by academia with strong skepticism, and the results and their publicizing has been cited as being driven by a combination of nationalist and regional interests. In 2011, a combined effort by the Stanford University, New York University, Washington University in St. Louis, and Purdue University has provided the strongest evidence yet that there is only one single origin of domesticated rice, in the Yangtze Valley of China. The earliest remains of the grain in the Indian subcontinent have been found in the Indo-Gangetic Plain and date from 7000–6000 BC though the earliest widely accepted date for cultivated rice is placed at around 3000–2500 BC with findings in regions belonging to the Indus Valley Civilization. Perennial wild rices still grow in Assam and Nepal. It seems to have appeared around 1400 BC in southern India after its domestication in the northern plains. It then spread to all the fertile alluvial plains watered by rivers. Cultivation and cooking methods are thought to have spread to the west rapidly and by medieval times, southern Europe saw the introduction of rice as a hearty grain. Rice spread to the Middle East where, according to Zohary and Hopf (2000, p. 91), O. sativa was recovered from a grave at Susa in Iran (dated to the 1st century AD). In a recent study, scientist have found a link for differences in human culture based on either wheat or rice cultivating races since ancient times. African rice has been cultivated for 3500 years. Between 1500 and 800 BC, Oryza glaberrima propagated from its original centre, the Niger River delta, and extended to Senegal. However, it never developed far from its original region. 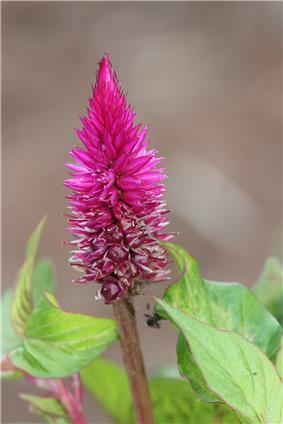 Its cultivation even declined in favour of the Asian species, which was introduced to East Africa early in the common era and spread westward. African rice helped Africa conquer its famine of 1203. Rice is the main export of Thailand, especially the white jasmine rice 105 (Dok Mali 105). Thailand has a large number of rice varieties, 3,500 kinds with different characters, and 5 kinds of wild rice cultivates. 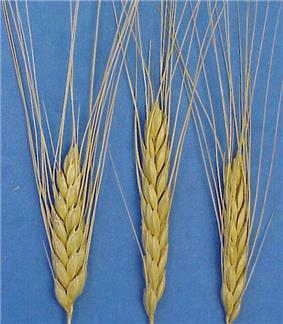 In each region of the country there are different rice seed types. Their use depends on weather, atmosphere, and topography. The northern region has both low lands and high lands. The farmers’ usual crop is non-glutinous rice  such as Niew Sun Pah Tong rice seeds. 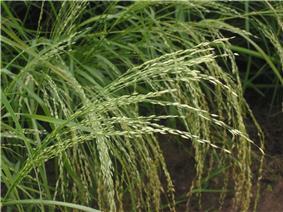 This rice is naturally protected from leaf disease, and the paddy has a brown color. 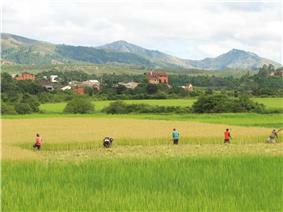 The northeastern region has a large area, where farmers can cultivate about 36 million square meters of rice. Although most of them are plains and dry areas, they can grow the white jasmine rice 105 which is the most famous Thai rice. The white jasmine rice was developed in Chonburi province first and after that it was grown in many areas in the country but the rice from this region has a high quality, because it's softer, whiter and more fragrant. This rice can resist drought, acidic soil, and alkaline soil. The central region is mostly composed of plains. Most farmers grow Jao rice. For example the Pathum Thani 1 rice which has qualities similar to the white jasmine 105 rice. Their paddy has the color of thatch and their cooked rice has fragrant grains also. In the southern region, most farmers transplant around boundaries to the flood of plain or plain between mountains. Farming is the region is slower than other regions because the rainy season comes late. The popular rice varieties in this area are the Leb Nok Pattani seeds, a type of Jao rice. Their paddy has the color of thatch and it can be processed to make noodles. Rice was grown in some areas of southern Iraq. With the rise of Islam it moved north to Nisibin, the southern shores of the Caspian Sea(Iran) and then beyond the Muslim world into the valley of the Volga. In Egypt, rice is mainly grown in the Nile Delta. In Israel, rice came to be grown in the Jordan Valley. Rice is also grown in Saudi Arabia at Al-hasa Oasis and in Yemen. Rice was known to the Classical world, being imported from Egypt, and perhaps west Asia. It was known to Greece by returning soldiers from Alexander the Great's military expedition to Asia. Large deposits of rice from the first century A.D. have been found in Roman camps in Germany. Muslims also brought rice to Sicily, where it was an important crop long before it is noted in the plain of Pisa (1468) or in the Lombard plain (1475), where its cultivation was promoted by Ludovico Sforza, Duke of Milan, and demonstrated in his model farms. Rice is not native to the Americas but was introduced to Latin America and the Caribbean by  Recent scholarship suggests that enslaved Africans played an active role in the establishment of rice in the New World and that African rice was an important crop from an early period. Varieties of rice and bean dishes that were a staple dish along the peoples of West Africa remained a staple among their descendants subjected to slavery in the Spanish New World colonies, Brazil and elsewhere in the Americas. 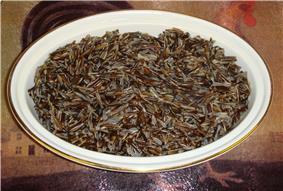 The Native Americans of what is now the Eastern United States may have practiced extensive agriculture with forms of wild rice (Zizania palustris), which looks similar to but it not directly related to rice. In the United States, Savannah. Rice culture in the southeastern U.S. became less profitable with the loss of slave labor after the cultivar has been preserved and there are current attempts to reintroduce it as a commercially grown crop. In the southern United States, rice has been grown in southern Arkansas, Louisiana, and east Texas since the mid-19th century. Many Cajun farmers grew rice in wet marshes and low lying prairies where they could also farm crayfish when the fields were flooded. In recent years rice production has risen in North America, especially in the Mississippi embayment in the states of Arkansas and Mississippi (see also Arkansas Delta and Mississippi Delta). Rice cultivation began in California during the California Gold Rush, when an estimated 40,000 Chinese laborers immigrated to the state and grew small amounts of the grain for their own consumption. However, commercial production began only in 1912 in the town of Richvale in Butte County. By 2006, California produced the second largest rice crop in the United States, after Arkansas, with production concentrated in six counties north of Sacramento. Unlike the Arkansas–Mississippi Delta region, California's production is dominated by short- and medium-grain japonica varieties, including cultivars developed for the local climate such as Calrose, which makes up as much as 85% of the state's crop. Although attempts to grow rice in the well-watered north of Australia have been made for many years, they have consistently failed because of inherent iron and pests. The world dedicated 162.3 million hectares in 2012 for rice cultivation and the total production was about 738.1 million tonnes. The average world farm yield for rice was 4.5 tonnes per hectare, in 2012. 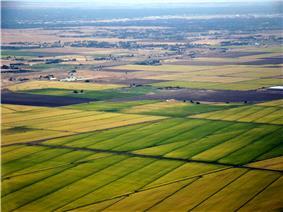 Rice farms in Egypt were the most productive in 2012, with a nationwide average of 9.5 tonnes per hectare. Second place: Australia - 8.9 tonnes per hectare. Third place: USA - 8.3 tonnes per hectare. Rice is a major food staple and a mainstay for the rural population and their food security. 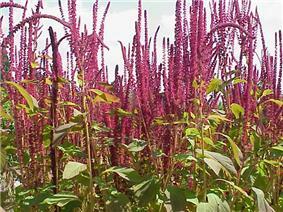 It is mainly cultivated by small farmers in holdings of less than 1 hectare. Rice is also a wage commodity for workers in the cash crop or non-agricultural sectors. Rice is vital for the nutrition of much of the population in Asia, as well as in Latin America and the Caribbean and in Africa; it is central to the food security of over half the world population. Developing countries account for 95% of the total production, with China and India alone responsible for nearly half of the world output. World production of rice has risen steadily from about 200 million tonnes of paddy rice in 1960 to over 678 million tonnes in 2009. The three largest producers of rice in 2009 were China (197 million tonnes), India (131 Mt), and Indonesia (64 Mt). Among the six largest rice producers, the most productive farms for rice, in 2009, were in China producing 6.59 tonnes per hectare. At 44 million hectares, India had the largest farm area under rice production in 2009. The rice farm productivity in India was about 45% of the rice farm productivity in China, and about 60% of the rice farm productivity in Indonesia. If India could adopt the farming knowledge and technology in use in China and Indonesia, India could produce an additional 100 million tonnes of rice, enough staple food for about 400 million people every year, and US$50 billion in additional annual income to its rice farmers (adjusted to 2010 dollars and global rice prices per tonne). In the 1990s, genetic studies took place in many European laboratories to increase rice production per hectare. Most of them were Dutch agricultural organizations united by HNGAC. These studies were later stopped due to lack of funding. In addition to the gap in farming system technology and knowledge, many rice grain producing countries have significant losses post-harvest at the farm and because of poor roads, inadequate storage technologies, inefficient supply chains and farmer's inability to bring the produce into retail markets dominated by small shopkeepers. A World Bank – FAO study claims 8% to 26% of rice is lost in developing nations, on average, every year, because of post-harvest problems and poor infrastructure. Some sources claim the post-harvest losses to exceed 40%.,Not only do these losses reduce food security in the world, the study claims that farmers in developing countries such as China, India and others lose approximately US$89 billion of income in preventable post-harvest farm losses, poor transport, the lack of proper storage and retail. 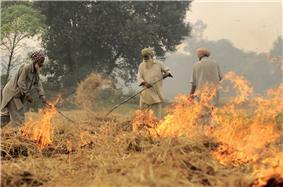 One study claims that if these post-harvest grain losses could be eliminated with better infrastructure and retail network, in India alone enough food would be saved every year to feed 70 to 100 million people over a year.However, other writers have warned against dramatic assessments of post-harvest food losses, arguing that "worst-case scenarios" tend to be used rather than realistic averages and that in many cases the cost of avoiding losses exceeds the value of the food saved. 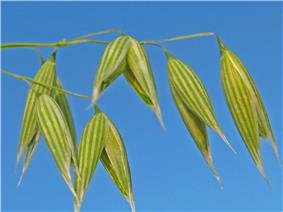 The seeds of the rice plant are first milled using a rice huller to remove the chaff (the outer husks of the grain). At this point in the process, the product is called brown rice. The milling may be continued, removing the bran, i.e., the rest of the husk and the germ, thereby creating white rice. White rice, which keeps longer, lacks some important nutrients; moreover, in a limited diet which does not supplement the rice, brown rice helps to prevent the disease beriberi. In some countries, a popular form, parboiled rice, is subjected to a steaming or parboiling process while still a brown rice grain. 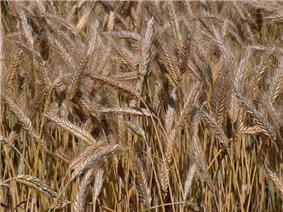 This causes nutrients from the outer husk, especially thiamine, to move into the grain itself. The parboil process causes a gelatinisation of the starch in the grains. 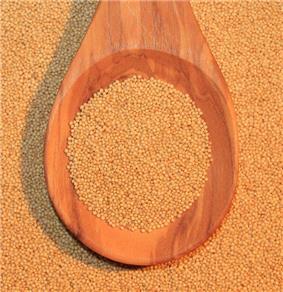 The grains become less brittle, and the color of the milled grain changes from white to yellow. 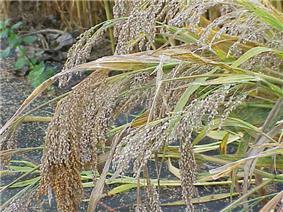 The rice is then dried, and can then be milled as usual or used as brown rice. Milled parboiled rice is nutritionally superior to standard milled rice. Parboiled rice has an additional benefit in that it does not stick to the pan during cooking, as happens when cooking regular white rice. This type of rice is eaten in parts of India and countries of West Africa are also accustomed to consuming parboiled rice. Raw rice may be ground into flour for many uses, including making many kinds of beverages, such as amazake, horchata, rice milk, and rice wine. Rice flour does not contain gluten, so is suitable for people on a gluten-free diet. Rice may also be made into various types of noodles. Raw, wild, or brown rice may also be consumed by raw-foodist or fruitarians if soaked and sprouted (usually a week to 30 days – gaba rice). Unmilled rice, known as paddy (Indonesia and Malaysia: padi; Philippines, palay), is usually harvested when the grains have a moisture content of around 25%. In most Asian countries, where rice is almost entirely the product of smallholder agriculture, harvesting is carried out manually, although there is a growing interest in mechanical harvesting. 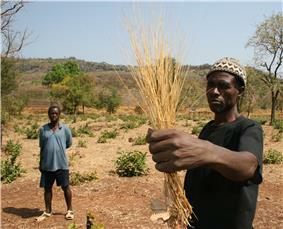 Harvesting can be carried out by the farmers themselves, but is also frequently done by seasonal labour groups. 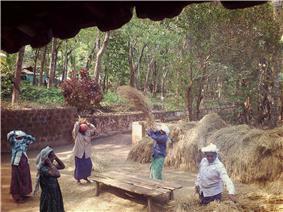 Harvesting is followed by threshing, either immediately or within a day or two. Again, much threshing is still carried out by hand but there is an increasing use of mechanical threshers. 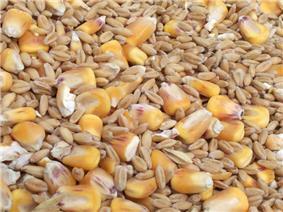 Subsequently, paddy needs to be dried to bring down the moisture content to no more than 20% for milling. A familiar sight in several Asian countries is paddy laid out to dry along roads. However, in most countries the bulk of drying of marketed paddy takes place in mills, with village-level drying being used for paddy to be consumed by farm families. Mills either sun dry or use mechanical driers or both. Drying has to be carried out quickly to avoid the formation of moulds. Mills range from simple hullers, with a throughput of a couple of tonnes a day, that simply remove the outer husk, to enormous operations that can process 4,000 tonnes a day and produce highly polished rice. A good mill can achieve a paddy-to-rice conversion rate of up to 72% but smaller, inefficient mills often struggle to achieve 60%. These smaller mills often do not buy paddy and sell rice but only service farmers who want to mill their paddy for their own consumption. Developing countries are the main players in the world rice trade, accounting for 83% of exports and 85% of imports. While there are numerous importers of rice, the exporters of rice are limited. Just five countries – Thailand, Vietnam, China, the United States and India – in decreasing order of exported quantities, accounted for about three-quarters of world rice exports in 2002. However, this ranking has been rapidly changing in recent years. In 2010, the three largest exporters of rice, in decreasing order of quantity exported were Thailand, Vietnam and India. By 2012, India became the largest exporter of rice with a 100% increase in its exports on year to year basis, and Thailand slipped to third position. Together, Thailand, Vietnam and India accounted for nearly 70% of the world rice exports. On April 30, 2008, Thailand announced plans for the creation of the cartel for rice. However, little progress had been made by mid-2011 to achieve this. Rice cultivation on wetland rice fields is thought to be responsible for 1.5% of the anthropogenic methane emissions. Rice requires slightly more water to produce than other grains. Rice production uses almost a third of Earth’s fresh water. Rice pests are any microbes with the potential to reduce the yield or value of the rice crop (or of rice seeds). Rice pests include weeds, pathogens, insects, nematode, rodents, and birds. A variety of factors can contribute to pest outbreaks, including climatic factors, improper irrigation, the overuse of insecticides and high rates of nitrogen fertilizer application. 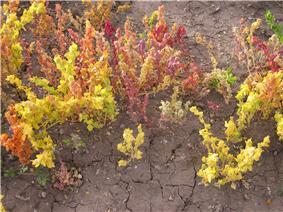 Weather conditions also contribute to pest outbreaks. For example, rice gall midge and army worm outbreaks tend to follow periods of high rainfall early in the wet season, while thrips outbreaks are associated with drought. Major rice insect pests include: the brown planthopper (BPH), several spp. of stemborers – including those in the genera Scirpophaga and Chilo, the rice gall midge, several spp. of rice bugs – notably in the genus Leptocorisa, the rice leafroller and rice weevils. 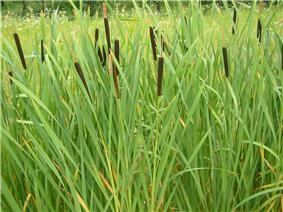 These include: the apple snail Pomacea canaliculata, panicle rice mite, rats, and the weed Echinochloa crusgali. Crop protection scientists are trying to develop rice pest management techniques which are sustainable. In other words, to manage crop pests in such a manner that future crop production is not threatened. Sustainable pest management is based on four principles: biodiversity, host plant resistance (HPR), landscape ecology, and hierarchies in a landscape – from biological to social. At present, rice pest management includes cultural techniques, pest-resistant rice varieties, and pesticides (which include insecticide). Increasingly, there is evidence that farmers' pesticide applications are often unnecessary, and even facilitate pest outbreaks. By reducing the populations of natural enemies of rice pests, misuse of insecticides can actually lead to pest outbreaks. The International Rice Research Institute (IRRI) demonstrated in 1993 that an 87.5% reduction in pesticide use can lead to an overall drop in pest numbers. IRRI also conducted two campaigns in 1994 and 2003, respectively, which discouraged insecticide misuse and smarter pest management in Vietnam. Rice plants produce their own chemical defenses to protect themselves from pest attacks. Some synthetic chemicals, such as the herbicide 2,4-D, cause the plant to increase the production of certain defensive chemicals and thereby increase the plant’s resistance to some types of pests. Conversely, other chemicals, such as the insecticide imidacloprid, can induce changes in the gene expression of the rice that cause the plant to become more susceptible to attacks by certain types of pests. 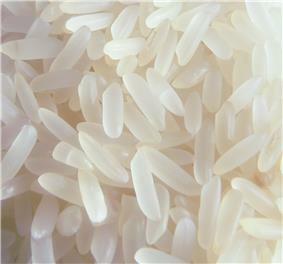 5-Alkylresorcinols are chemicals that can also be found in rice. Over time, the use of pest resistant rice varieties selects for pests that are able to overcome these mechanisms of resistance. When a rice variety is no longer able to resist pest infestations, resistance is said to have broken down. Rice varieties that can be widely grown for many years in the presence of pests and retain their ability to withstand the pests are said to have durable resistance. Mutants of popular rice varieties are regularly screened by plant breeders to discover new sources of durable resistance. Rice is parasitized by the weed eudicot Striga hermonthica. which is of local importance for this crop. Draft base pairs). 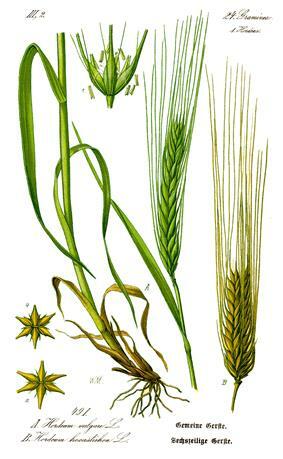 Rice was the first crop with a complete genome sequence. Flooding is an issue that many rice growers face, especially in South and South East Asia where flooding annually affects 20 million hectares. Standard rice varieties cannot withstand stagnant flooding of more than about a week, mainly as it disallows the plant access to necessary requirements such as sunlight and essential gas exchanges, inevitably leading to plants being unable to recover. In the past, this has led to a massive losses in yields, such as in the Philippines, where in 2006, rice crops worth $65 million were lost to flooding. In response to this hazard, a variety of rice named Swarna Sub1 was developed via marker-assisted selection, with the ability to withstand prolonged periods of around 14 days beneath a flooded plain. The submergence tolerance ability of this variety is conferred by the presence of the Sub1A gene, introgressed from the Indian cultivar FR13A into the flood-vulnerable (but high yielding) cultivar Swarna. Swarna Sub1 effectively enters a dormant, energy conserving state upon being submerged in a flooded rice paddy, a process that involves the finely controlled metabolism of enzymes such amylases, starch phosphorylase and alcohol dehydrogenase, allowing the plant to survive with limited oxygen and sunlight unlike its standard variety relatives. Given that the presence of the Sub1A gene does not impact upon the quality or quantity of the rice obtained, this variety has been very popular, with 1.7 million hectares of land in India having Swarna Sub1 and other flood resistant varieties used instead of conventional rice crops. Under drought conditions, without sufficient water to afford them the ability to obtain the required levels of nutrients from the soil, conventional commercial rice varieties can be severely impacted – for example yield losses as high as 40% have affected some parts of India, with resulting losses of around US$800 million annually. – for example, roughly 1 million hectares of the coastal areas of Bangladesh are affected by saline soils. These high concentrations of salt can severely impact upon rice plants’ normal physiology, especially during early stages of growth, and as such farmers are often forced to abandon these otherwise potentially usable areas. Progress has been made, however, in developing rice varieties capable of tolerating such conditions; the hybrid created from the cross between the commercial rice variety IR56 and the wild rice species Oryza coarctata is one example. O. coarctata is capable of successful growth in soils with double the limit of salinity of normal varieties, but lacks the ability to produce edible rice. 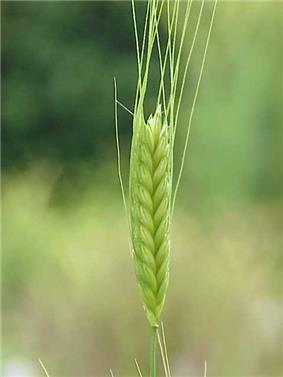 Developed by the International Rice Research Institute, the hybrid variety can utilise specialised leaf glands that allow for the removal of salt into the atmosphere. It was initially produced from one successful embryo out of 34,000 crosses between the two species; this was then backcrossed to IR56 with the aim of preserving the genes responsible for salt tolerance that were inherited from O. coarctata. Furthermore, extensive trials are planned prior to the new variety being available to farmers by approximately 2017–18. Phosop, the popular rice deity in Thailand. Dewi Sri is the traditional rice goddess of the Javanese, Sundanese, and Balinese people in Indonesia. Most rituals involving Dewi Sri are associated with the mythical origin attributed to the rice plant, the staple food of the region. In Thailand a similar rice deity is known as Phosop; she is a deity more related to ancient local folklore than a goddess of a structured, mainstream religion. The same female rice deity is known as Po Ino Nogar in Cambodia and as Nang Khosop in Laos. Ritual offerings are made during the different stages of rice production to propitiate the Rice Goddess in the corresponding cultures. ^ Yang, Lihui et al. (2005). Handbook of Chinese Mythology. New York: Oxford University Press. p. 198. ^ a b c Molina, J.; Sikora, M.; Garud, N.; Flowers, J. M.; Rubinstein, S.; Reynolds, A.; Huang, P.; Jackson, S.; Schaal, B. A.; Bustamante, C. D.; Boyko, A. R.; Purugganan, M. D. (2011). "Molecular evidence for a single evolutionary origin of domesticated rice". Proceedings of the National Academy of Sciences 108 (20): 8351. ^ a b c Huang, Xuehui; Kurata, Nori; Wei, Xinghua; Wang, Zi-Xuan; Wang, Ahong; Zhao, Qiang; Zhao, Yan; Liu, Kunyan et al. (2012). "A map of rice genome variation reveals the origin of cultivated rice". Nature 490 (7421): 497–501. ^ Thorley, John (1969). "The development of trade between the Roman Empire and the East under Augustus". Greece & Rome 16 (2): 222. ^ Witzel, Michael (2009). "The linguistic history of some Indian domestic plants". Journal of Biosciences 34 (6): 829–833. ^ Fine Cooking editors (ed.). "Guide to Rice". Fine Cooking. Retrieved July 24, 2014. ^ Shoichi Ito and Yukihiro Ishikawa. "Marketing of Value-Added Rice Products in Japan: Germinated Grown Rice and Rice Bread". Tottori University, Japan. Retrieved February 12, 2004. ^ "Rice is Life". Food and Agricultural Organization of the United Nations. 2004. ^ "Nutrition Info: white rice cooked versus brown rice cooked". ^ Jang, Sungjoon and Xu, Zhimin (2009). "Lipophilic and Hydrophilic Antioxidants and Their Antioxidant Activities in Purple Rice Bran". Journal of Agricultural and Food Chemistry 57 (3): 858–862. ^ Ling, WH; Cheng, QX; Ma, J; Wang, T (2001). "Red and Black Rice Decrease Atherosclerotic Plaque Formation and Increase Antioxidant Status in Rabbits". Journal of Nutrition 131 (5): 1421–1426. ^ "Nutrient data laboratory". United States Department of Agriculture. Retrieved June 2014. ^ EFSA Panel on Contaminants in the Food Chain (CONTAM) (October 28, 2009). "Scientific Opinion on Arsenic in Food". EFSA Journal (European Food Safety Authority) 7 (10): 1351. ^ "Arsenic in your food: Our findings show a real need for federal standards for this toxin". ^ Potera, Carol (2007). "Food Safety: U.S. Rice Serves Up Arsenic". Environmental Health Perspectives 115 (6): A296. ^ "Can reheating rice cause food poisoning?". National Health Service (England) NHS.uk. ^ More rice with less water cornell.edu. Retrieved on May 13, 2012. ^ Vaughan, DA; Lu, B; Tomooka, N (2008). "The evolving story of rice evolution". Plant Science 174 (4): 394–408. ^ a b c Harris, David R. (1996). The Origins and Spread of Agriculture and Pastoralism in Eurasia. Psychology Press. p. 565. ^ MacNeish R. S. and Libby J. eds. (1995) Origins of Rice Agriculture. Publications in Anthropology No. 13. ^ a b Whitehouse, David (October 21, 2003). "World's 'oldest' rice found". ^ Kim, Minkoo (2008). Habu, Junko; Fawcett, Clare; Matsunaga, John M., ed. Evaluating multiple narratives: Beyond nationalist, colonialist, imperialist archaeologies. New York: Springer. p. 128. ^ Kim, Minkoo (2008). "Multivocality, Multifaceted Voices, and Korean Archaeology". Evaluating Multiple Narratives: Beyond Nationalist, Colonialist, Imperialist Archaeologies. New York: Springer. p. 118. 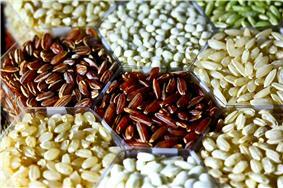 ^ "Rice's Origins Point to China, Genome Researchers Conclude". ScienceNewsline. May 3, 2011. Archived from the original on May 17, 2013. Retrieved March 13, 2014. ^ Molina, J.; Sikora, M.; Garud, N.; Flowers, J.M. ; Rubinstein, S.; Reynolds, A.; Huang, P.; Jackson, S.; Schaal, B.A. ; Bustamante, C.D. ; Boyko, A.R. ; Purugganan, M.D. (2011). "Molecular evidence for a single evolutionary origin of domesticated rice". Proceedings of the National Academy of Sciences 108 (20): 8351–8356. ^ T. Talhelm. "Large-Scale Psychological Differences Within China Explained by Rice Versus Wheat Agriculture". Retrieved October 6, 2014. ^ Maddox, Gregory [ed.] (2006). Sub-Saharan Africa: An Environmental History. ABC-CLIO. p. 267. ISBN 1851095551. ^ a b National Research Council (1996). "African Rice". 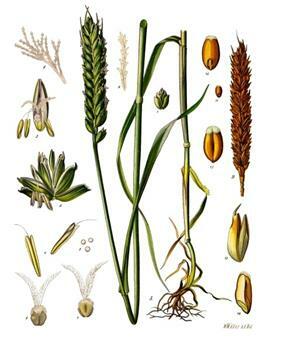 Lost Crops of Africa: Volume I: Grains. Lost Crops of Africa 1. National Academies Press. ^ Pazuki, Arman & Sohani, Mehdi (2013). "Phenotypic evaluation of scutellum-derived calluses in ‘Indica’ rice cultivars" (PDF). Acta Agriculturae Slovenica 101 (2): 239–247. ^ Sallare, Robert (1993), The Ecology of the Ancient Greek World, Cornell Univ. Press, p. 23, ISBN 0801426154. ^ Darby, H.C. (1957). "The face of Europe on the eve of the great discoveries". The New Cambridge Modern History 1. p. 32. ^ a b West, Jean M. Rice and Slavery at the Wayback Machine (archived January 1, 2007). Slavery in America. Retrieved on May 13, 2012. ^ Carney, Judith Ann (2001). Black rice: the African origins of rice cultivation in the Americas. Cambridge: Harvard University Press. ^ Farm Raised Crawfish. Crawfish.com. Retrieved on May 13, 2012. ^ Lee, Ching (2005). 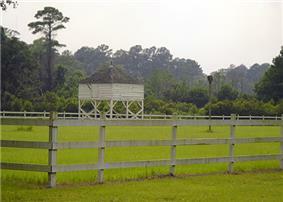 "Historic Richvale – the birthplace of California rice". California Farm Bureau Federation. Retrieved August 10, 2007. ^ Sumner, Daniel A. and Brunke, Henrich (September 2003). "The economic contributions of the California rice industry". California Rice Commission. Archived from the original on April 26, 2006. Retrieved August 10, 2007. ^ fao.org (FAOSTAT). "Countries by commodity (Rice, paddy)". Retrieved February 11, 2014. ^ a b "FAOSTAT: Production-Crops, 2012 data". Food and Agriculture Organization of the United Nations. 2014. 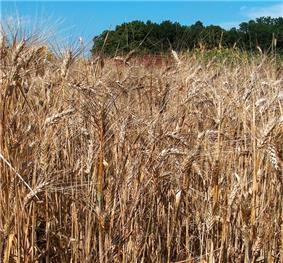 ^ "World Wheat, Corn and Rice". Oklahoma State University, FAOSTAT. 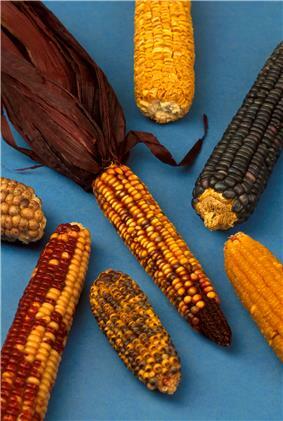 ^ "MISSING FOOD: The Case of Postharvest Grain Losses in Sub-Saharan Africa". The World Bank. April 2011. ^ Basavaraja, H.; Mahajanashetti, S.B. ; Udagatti, Naveen C (2007). "Economic Analysis of Post-harvest Losses in Food Grains in India: A Case Study of Karnataka". Agricultural Economics Research Review 20: 117–126. ^ "A market-orientated approach to post-harvest management.". FAO. ^ Risks of Talcum Powder. Preventcancer.com. Retrieved on May 13, 2012. ^ Thomas, Jo (February 7, 1981). Talc coating on rice called peril. NewYorkTimes.com. ^ Jianguo G. Wu, Chunhai Shia and Xiaoming Zhanga (2003). "Estimating the amino acid composition in milled rice by near-infrared reflectance spectroscopy". Field Crops Research 75: 1. ^ a b c d Cendrowski, Scott (August 12, 2013). 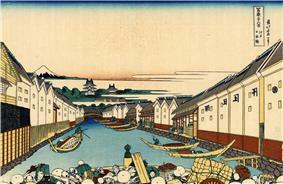 "The Rice Rush". ^ Yuan, L.P. (2010). "A Scientist’s Perspective on Experience with SRI in CHINA for Raising the Yields of Super Hybrid Rice". ^ Puckridge, Don (2004) The Burning of the Rice, Temple House Pty, ISBN 1877059730. ^ United States Department of Agriculture (USDA) Economic Research Service. "Briefing Rooms: Rice". Retrieved April 24, 2008. ^ "World Greenhouse Gas Emissions: 2005". World Resources Institute. Retrieved June 13, 2013. ^ "How better rice could save lives: A second green revolution - The Economist". The Economist. Retrieved October 6, 2014. ^ Neue Heinz-Ulrich (1993). "Methane emission from rice fields: Wetland rice fields may make a major contribution to global warming". BioScience 43 (7): 466–73. ^ "World Greenhouse Gas Emissions in 2005". ^ Welch, Jarrod R.; Vincent, J.R.; Auffhammer, M.; Dobermann, A.; Moya, P.; Dawe, D. (2010). "Rice yields in tropical/subtropical Asia exhibit large but opposing sensitivities to minimum and maximum temperatures". Proc. Natl. Acad. Sci. U.S.A. 107 (33): 14562–7. ^ Jahn, Gary C.; JA Litsinger, Y Chen and A Barrion (2007). "Integrated Pest Management of Rice: Ecological Concepts". In O Koul and GW Cuperus. Ecologically Based Integrated Pest Management. CAB International. pp. 315–366. ^ Jahn, Gary C.; Almazan, Liberty P.; Pacia, Jocelyn B. (2005). "Effect of Nitrogen Fertilizer on the Intrinsic Rate of Increase ofHysteroneura setariae(Thomas) (Homoptera: Aphididae) on Rice (Oryza sativaL.)". Environmental Entomology 34 (4): 938. ^ Douangboupha, B, K Khamphoukeo, S Inthavong, J Schiller, and GC Jahn. 2006. Pests and diseases of the rice production systems of Laos. Chapter 17, pp. 265–281. In JM Schiller, MB Chanphengxay, B Linquist, and S Appa Rao, editors. Rice in Laos. Los Baños (Philippines): IRRI.ISBN 978-971-22-0211-7. ^ Preap, V; Zalucki, MP and Jahn, GC (2006). "Brown planthopper outbreaks and management". Cambodian Journal of Agriculture 7 (1): 17–25. ^ "IRRI Rice insect pest factsheet: Stem borer". Rice Knowledge Bank. Archived from the original on 22 November 2014. ^ Benett J, Bentur JC, Pasula IC and Krishnaiah K (eds) (2004). New approaches to gall midge resistance in rice. International Rice Research Institute and Indian Council of Agricultural Research, ISBN 9712201988. ^ a b Jahn, GC; Domingo, I; Almazan, ML; Pacia, J; Pacia, Jocelyn (2004). "Effect of rice bug Leptocorisa oratorius (Hemiptera: Alydidae) on rice yield, grain quality, and seed viability". Journal of economic entomology 97 (6): 1923–7. ^ Jahn, GC; Domingo, I; Almazan, ML; Pacia, J. (2004). "Effect of rice bug Leptocorisa oratorius (Hemiptera: Alydidae) on rice yield, grain quality, and seed viability". J Econ Entomol 97 (6): 1923–7. ^ IRRI Rice Diseases factsheets. Knowledgebank.irri.org. Retrieved on May 13, 2012. 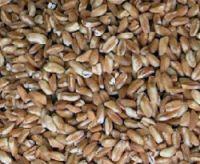 ^ Rice Brown Spot: essential data. CBWinfo.com. Retrieved on May 13, 2012. ^ Cochliobolus . Invasive.org (May 4, 2010). Retrieved on May 13, 2012. ^ Singleton G, Hinds L, Leirs H and Zhang Zh (Eds.) (1999) "Ecologically-based rodent management" ACIAR, Canberra. Ch. 17, pp. 358–371 ISBN 1-86320-262-5. ^ Pheng, S, B Khiev, C Pol and GC Jahn (2001). 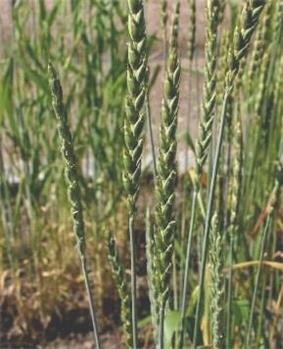 "Response of two rice cultivars to the competition of Echinochloa crus-gali (L.) P. Beauv". International Rice Research Institute Notes (IRRN) 26 (2): 36–37. ^ Jahn, GC, B. Khiev, C Pol, N Chhorn, S Pheng, and V Preap. 2001. Developing sustainable pest management for rice in Cambodia. pp. 243–258, In S. Suthipradit, C. Kuntha, S. Lorlowhakarn, and J. Rakngan [eds.] "Sustainable Agriculture: Possibility and Direction" Bangkok (Thailand): National Science and Technology Development Agency. ^ Savary, S.; Horgan, F.; Willocquet, L.; Heong, K.L. (2012). "A review of principles for sustainable pest management in rice". Crop Protection 32: 54. ^ Jahn, GC, S Pheng, B Khiev, and C Pol. 1996. Farmers’ pest management and rice production practices in Cambodian lowland rice. Cambodia-IRRI-Australia Project (CIAP), Baseline Survey Report No. 6. CIAP Phnom Penh, Cambodia. ^ Bangladeshi farmers banish insecticides. SCIDEV.net (July 30, 2004). Retrieved on May 13, 2012. ^ Wang, Li-Ping; Shen, Jun; Ge, Lin-Quan; Wu, Jin-Cai; Yang, Guo-Qin; Jahn, Gary C. (2010). "Insecticide-induced increase in the protein content of male accessory glands and its effect on the fecundity of females in the brown planthopper Nilaparvata lugens Stål (Hemiptera: Delphacidae)". Crop Protection 29 (11): 1280. ^ Jahn, G.C. (1992). "Rice pest control and effects on predators in Thailand". Insecticide & Acaricide Tests 17: 252–3. ^ Cohen, J. E., Schoenly, K., Heong, K. L., Justo, H., Arida, G., Barrion, A. T., & Litsinger, J. A.; Schoenly; Heong; Justo; Arida; Barrion; Litsinger (1994). "A Food-Web Approach to Evaluating the Effect of Insecticide Spraying on Insect Pest Population-Dynamics in a Philippine Irrigated Rice Ecosystem". Journal of Applied Ecology 31– (4): 747–763. ^ ‘Three Gains, Three Reductions’. Ricehoppers.net (October 12, 2010). Retrieved on May 13, 2012. ^ No Early Spray ricehoppers.net (April 2010). Retrieved on May 13, 2012. ^ Xin, Zhaojun; Yu, Zhaonan; Erb, Matthias; Turlings, Ted C. J.; Wang, Baohui; Qi, Jinfeng; Liu, Shengning; Lou, Yonggen (2012). "The broad-leaf herbicide 2,4-dichlorophenoxyacetic acid turns rice into a living trap for a major insect pest and a parasitic wasp". New Phytologist 194 (2): 498–510. ^ Cheng, Yao; Shi, Zhao-Peng; Jiang, Li-Ben; Ge, Lin-Quan; Wu, Jin-Cai; Jahn, Gary C. (2012). "Possible connection between imidacloprid-induced changes in rice gene transcription profiles and susceptibility to the brown plant hopper Nilaparvata lugens Stål (Hemiptera: Delphacidae)". Pesticide Biochemistry and Physiology 102 (3): 213–219. ^ Suzuki, Yoshikatsu et al. (2003). "Biosynthesis of 5-alkylresorcinol in rice: incorporation of a putative fatty acid unit in the 5-alkylresorcinol carbon chain". Bioorganic Chemistry 31 (6): 437–452. ^ Khiev, B.; Jahn, G.C. ; Pol, C.; Chhorn N. (2000). "Effects of simulated pest damage on rice yields". IRRN 25 (3): 27–8. ^ Sangha, J.S. ; Chen, Y.H. ; Kaur, J.; Khan, Wajahatullah; Abduljaleel, Zainularifeen; Alanazi, Mohammed S.; Mills, Aaron; Adalla, Candida B. et al. (2013). "Proteome Analysis of Rice (Oryza sativa L.) Mutants Reveals Differentially Induced Proteins during Brown Planthopper (Nilaparvata lugens) Infestation". Int. J. Mol. Sci. 14 (2): 3921–3945. ^ a b Sangha, Jatinder Singh; Chen, Yolanda H.; Palchamy, Kadirvel; Jahn, Gary C.; Maheswaran, M.; Adalla, Candida B.; Leung, Hei (2008). "Categories and Inheritance of Resistance toNilaparvata lugens(Hemiptera: Delphacidae) in Mutants of Indica Rice 'IR64'". Journal of Economic Entomology 101 (2): 575–83. ^ Kogan, M.; Ortman, E.F. (1978). "Antixenosis a new term proposed to defined to describe Painter's "non-preference" modality of resistance". Bull. Entomol. Soc. Am. 24: 175–6. ^ Liu, L., Z. Van, Q. Y. Shu, and M. Maluszynski (2004). "Officially released mutant varieties in China". Mutat. Breed. Rev 14 (1): 64. ^ Yoshida, Satoko; Maruyama, Shinichiro; Nozaki, Hisayoshi (2010). "Horizontal Gene Transfer by the Parasitic Plant Stiga hermanthica". Science 328 (5982): 1128. ^ "The U.S. Rice Export Market". ^ T. Morinaga (1968). 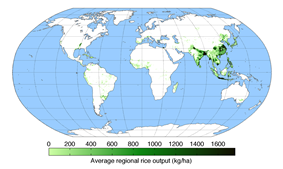 "Origin and geographical distribution of Japanese rice". Trop. Agric. Res. Ser. 3: 1–15. ^ SM Humayun Kabir (2012). "Rice". In Sirajul Islam and Ahmed A. Jamal. Banglapedia: National Encyclopedia of Bangladesh (Second ed.). ^ Rice. Cgiar.org. Retrieved on May 13, 2012. ^ Jackson MT (1997). "Conservation of rice genetic resources: the role of the International Rice Genebank at IRRI". Plant Mol. Biol. 35 (1–2): 61–7. 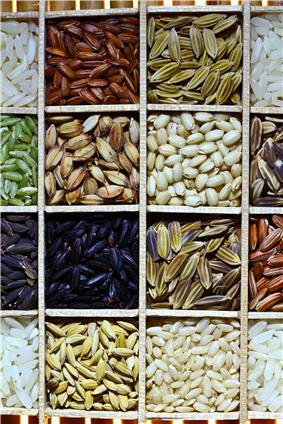 ^ Rice Varieties at the Wayback Machine (archived July 13, 2006). IRRI Knowledge Bank. ^ Yamaguchi, S. (2008). "Gibberellin Metabolism and its Regulation". Ann Rev Plant Biol 59: 225–251. ^ "Researchers Determine That Golden Rice Is an Effective Source of Vitamin A". ^ Marris, Emma (May 18, 2007). "Rice with human proteins to take root in Kansas". Nature. ^ Bethell DR, Huang J; Huang (2004). "Recombinant human lactoferrin treatment for global health issues: iron deficiency and acute diarrhea". Biometals 17 (3): 337–42. ^ " Swarna Sub1: flood resistant rice variety" The Hindu (2011). Retrieved October 31, 2013. ^ a b c d "Climate change-ready rice" International Rice Research Institute (IRRI). Retrieved October 31, 2013. 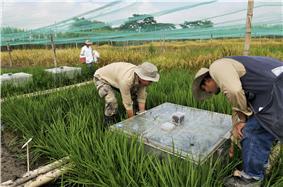 ^ "Best minds meet to help crops survive flooding" International Rice Research Institute (IRRI) (2013). Retrieved October 31, 2013. ^ a b "Drought, submergence and salinity management" International Rice Research Institute (IRRI). Retrieved September 29, 2013. ^ " Roots breakthrough for drought resistant rice" Phys.org (2013). Retrieved September 30, 2013. ^ "Less salt, please" Fredenburg, P. (2007). Retrieved September 30, 2013. ^ a b c "Wild parent spawns super salt tolerant rice" International Rice Research Institute (IRRI) (2013). Retrieved September 30, 2013. ^ "Do rice and salt go together?" Ferrer, B. (2012). Retrieved September 30, 2013. ^ a b "Breakthrough in salt-resistant rice research – single baby rice plant may hold the future to extending rice farming" Integrated Breeding Platform (IBP) (2013). Retrieved October 6, 2013. ^ "Early Mythology - Dewi Sri". Sunda.org. Retrieved 2012-08-26. ^ "(Indonesian) Mitos Nyi Pohaci/Sanghyang Asri/Dewi Sri". My.opera.com. 2008-03-01. Retrieved 2012-08-26. ^ "On the Role of Food Habits in the Context of the Identity and Cultural Heritage of South and South East Asia". Retrieved October 6, 2014. The genetic wonder of Thai rice. Plan Motif Publisher. 1998. p. 110. Science and technology with Thai rice, National center for genetic engineering. The plublic information department. 2003. p. 30. The genetic wonder of Thai rice. Plan Motif Publisher. 1998. p. 45. Pazuki, Arman & Sohani, Mehdi (2013). 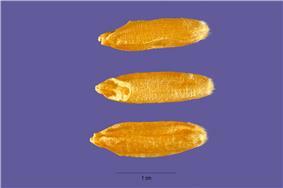 "Phenotypic evaluation of scutellum-derived calluses in ‘Indica’ rice cultivars" (PDF). Acta Agriculturae Slovenica 101 (2): 239–247.